I was pleasantly surprised yesterday as the phone is miraculously fixed. Didn’t do anything. I am sure Sky would say the same – but someone did something because it now works. On Monday I removed the huge bandage protecting my knee. It was a good result, with some swelling and bruising but no major damage, Just a couple of stitches on either side, and Sally will be removing those later today. Painkillers at the ready. That meant I could drive her automatic on Tuesday, and I diligently filled it up with fuel. The plan was to stay over in Nottingham on Tuesday and Wednesday night, but the Goose Fair was on so hotels were expensive and not always available. Sally offered to help, and found loads of cheap options, but when I asked her to find me one that she would stay in for less than £100 she drew a blank. Funny that. So, I drove home on Tuesday and went back on Wednesday morning, by which time the swelling had increased and it was getting a bit achy. I checked in to the Britannia on Wednesday night. Just don’t, that’s all I am saying. I did some research and decided to check out Annie’s Burger Shack in the Lace Market area of Robin Hood’s city. It is a proper burger restaurant, with about 20 variations on the menu, craft ales and lagers, and a whole host of interesting sides and sauces. It is not cheap, but then again its not MacDonalds. The burgers were amazing. Big thick patties, chunky bacon and just the right amount of cheese. Sweet potato fries cooked to perfection and a couple of proper pints. It was very busy – if you are in Nottingham I would recommend going online and booking a table. I avoided the hotel for as long as I could, but when I did return I decided to iron my shirt for the following morning. No, Sally doesn’t do that. There was no iron in the room so I rang reception and it arrived, along with an ironing board that looked like a pair of Nottingham’s finest had been wrestling in oil on it. I covered it with a towel and got the job done. The bed seemed comfortable and the room was warm enough but it was a disturbed sleep, and I got up early for a shower. That’s when I found out that the hot water tap in the sink did not work, the flush on the toilet needed special attention and the wall on the side of the shower had a number of suspicious looking hairs on it. They had kindly provided a shampoo and conditioner dispenser on the wall by the shower head. I decided that the gooey thick white liquid was a step too far. I checked out a short time later and, well, just don’t! Immobility this week gave me the opportunity to try a new recipe. Its not really a recipe – just melted chocolate formed into bowls. “What are they for?” Sally asked as she munched her way through the first one. An hour later it didn’t really matter what the bowls were intended for. They had all gone (not all Sally, obviously – Ole and Zac helped). There are still a couple of chick pea chocolate cup cakes left (they are much better than they sound), but its Saturday so I think their days are numbered. Thursday night was a welcome return home, with news that Zac had been involved in his first fight at Chapel School. No great drama, apparently he won. It was not of the epic ‘Schmitt on the bus’ fight that Ole retold with great enthusiasm and quite a bit of confusion, but it was Zac’s fight and he was incredibly cool about it. I am now getting fashion tips from my teenage son. ‘You need to pull the bottom of your jeans up’ ‘Don’t tuck your polo shirt in’ etc. Hmm, as he struggled to walk due to the trend of putting his feet on his shoes rather than actually in them I could have pointed out the error of his ways, but I guess that’s not what dads are for. Yesterday was my birthday. And a very nice day it was too. Sally smelt wonderful, I complimented her on it, and then again later in the day as the fragrance was still evident, in a nice way, you know, not overpowering in a Charlie way! Big mistake. It turns out to be Jo Malone. I suspect that is going to cost me a fortune. It was good to see Gabi, though she definitely won’t last too much longer before giving birth, and then my little girl will finally have grown up. Ahhh. I wonder when that will happen to me? Never I suspect. Anyway, Zac decided to use the excuse of my birthday to not move much and deliberately miss his bus, so mum had to be out early to drop him off at school (that’s no XBox for you my lad). Even when Zac came home and showed us his glowing science report the ban remained in place, but he did get rumbled in one particular subject. The teacher spotted the flaw in his homework. “That’s not your handwriting Zac, and I’m not giving your mum a merit.” Sally was most disappointed. Here’s an interesting development. The wine racks at home have now been filled with pots. Its not that we don’t have wine to fill them. There are bottles everywhere. 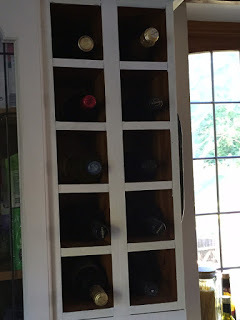 I pointed out that when I want to find some pots I look in the pots cupboard, and when I want to find a bottle of wine I look in the wine rack. There are even wine bottle sized partitions in the wine racks, which is kind of a clue. “They look nice,” was the illogical reply, followed by “and those pots are not for you to use.” So there you have it. Its not like we dont have enough wine racks. There is a huge one in the dining room. But I now might be tempted to look behind the pots to find out if there is a bottle of wine hidden away, and that could mean I risk putting the pot back facing the wrong way or some other heinous crime. Its a worry. Yesterday I also went to my first post op physio appointment. I once again went to see Carolyn Edwards in Whaley Bridge (above the pet supplies shop). She is very good, and trust me, I’ve used a lot of physios. Anyway, she was very pleased with the condition of the knee. Reduced swelling, little or no pain and a comprehensive report that I couldn’t understand. Then I told her I had been cycling which she was less impressed with. I only went from my house to Bridgemont and back, but even that was too far. She relented and said I should at least do some swimming and maybe a little cycling, then she detected the click under my kneecap. This was a concern not only because it was quite loud and uncomfortable, but also because it was unlikely to have been picked up by the surgeon. I return to see him in two weeks. It still promises to be a long road ahead, and I have just started a series of ice pack sessions that should at least help with the swelling. So, last night we headed for South 7 in Marple Bridge. We have been there before for splendid burgers, nice beer and a good atmosphere. I have to say that the place has gone downhill. I may have been spoiled by Annie’s two days earlier, but this was just not what I expected. The nachos (both the brisket and bbq bean) were great, but the burgers, sorry, no. Two cheapish patties rather than one big one gave them the look and feel of a Big Mac, and the fact that everything was smothered with sauce meant that flavours were masked anyway. Not what I expected, and although again it was not cheap, this time the food would not have been out of place under the Golden Arches. Won’t be going again. Lying at home immobilised gives me a great chance to catch up with stuff, one of which is Sapphire’s video. Of course, he is much bigger now, so I suppose I will have to make another one! Now that I am a week in to my recuperation I am allowed to drive my manual car again. I emptied Sally’s riding gear from the back seat, adjusted the sitting position, and then looked with alarm at the lack of fuel that she had left me. Bloody typical. I am tempted to syphon out the diesel that I put into hers!